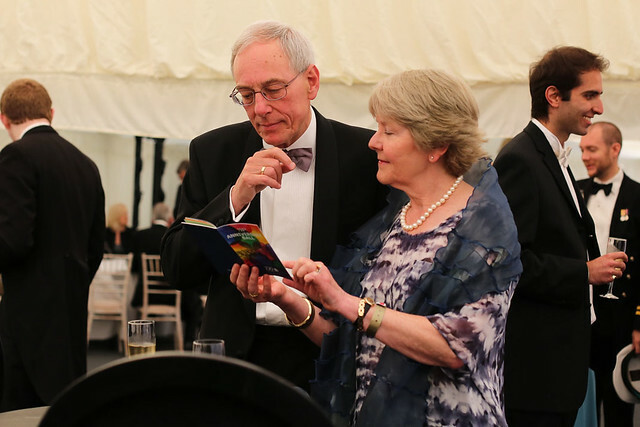 On the balmy summer evening of Saturday 28 June, Merton College opened its doors to Mertonians and their guests for the spectacular 750th Anniversary Ball – in celebration of the rich history of Merton College. For one night only, the entire College grounds were transformed and, from Front Quad to the Croquet Lawn, St Alban's Quad to Fellows' Garden, party-goers were entertained and indulged with food stalls, music and fairground entertainment. At the heart of the College, the Hall became a meeting place at which to relax and regale, with chocolate fountains and warm drinks throughout the night. The evening began with a drinks reception — the perfect opportunity to see old friends, as well as meet and be merry with the Fellows and students of Merton today — then moved to the marquee, where guests enjoyed a sumptuous banquet. After dinner entertainment was provided by the Pasadena Roof Orchestra, playing some classic big band jazz and swing of the 1920s and 30s, and then Mertonian and world-renowned DJ Andy Cato (of Groove Armada fame) took to the decks. The night was rounded off by a spectacular firework display and then a silent disco, giving those with boundless energy the opportunity to dance the night away while the rest of Oxford slept.